October is the most dangerous month for pedestrians. The days are shorter, the nights longer, and drivers have a harder time seeing pedestrians. With that in mind, Minnesota Department of Transportation officials will be out waving signs in busy intersections today to encourage drivers and pedestrians to watch out for each other. 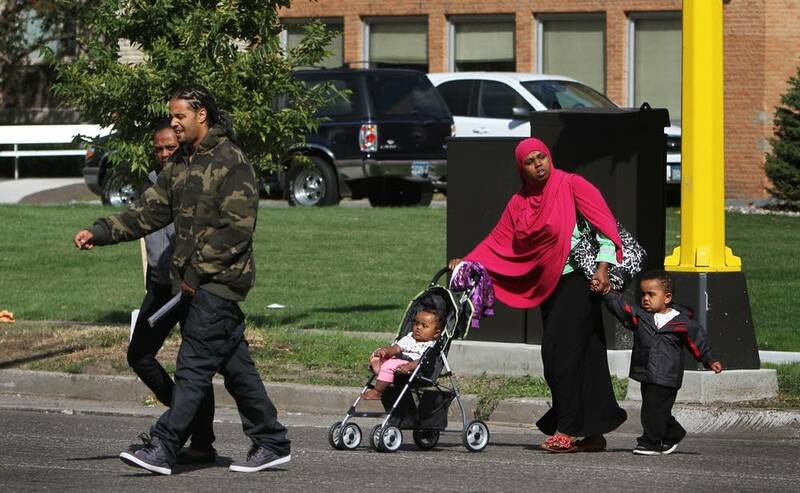 Safety messages will appear on banners at busy intersections in Minneapolis, St. Paul, Duluth, St. Cloud and Rochester. The campaign also includes billboards and ads on the radio and on buses. That kind of vigilance, officials say, could help prevent fatal injuries, like those Louise Laugen suffered last December when she was hit by car while walking home with groceries in Minneapolis. 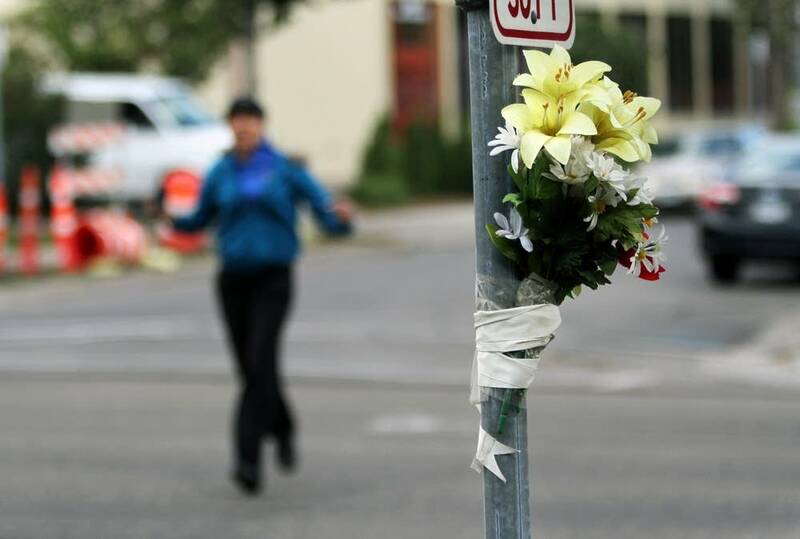 Laugen, 69, was one of 40 pedestrians killed last year across the state. More than 800 pedestrians were injured. So far this year, two dozen pedestrians have died. Public safety officials are concerned that the number of pedestrian deaths and injuries have remained consistent in recent years, while the number of fatal vehicle crashes has declined. "I think it's just a little bit harder of a nut to crack," said Sue Groth, the state's traffic engineer. "The laws are harder to enforce, and it involves both motorist and pedestrian behavior," Groth said. "A lot of this could be solved just with pedestrians and motorists looking for each other, making eye contact and following the laws." 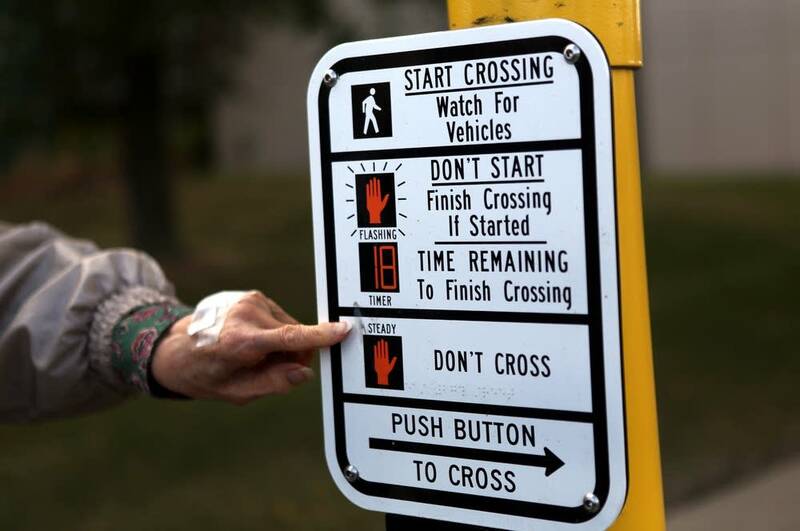 Groth said many motorists don't yield to pedestrians who are in the crosswalk, and many pedestrians either don't pay attention or cross the street against the light or away from the crosswalk. The numbers bear that out. Because motorists and pedestrians are equally at fault, transportation officials are targeting both groups with the safety campaign. Fall is a good time to get people's attention, Minnesota State Patrol spokesman Lt. Eric Roeske said. "Everyone's back at work, back at school," Roeske said. "We see the sun setting earlier, so there's more pedestrians out after it's dark compared to the summer months, and therefore it could make them a little more difficult to see." 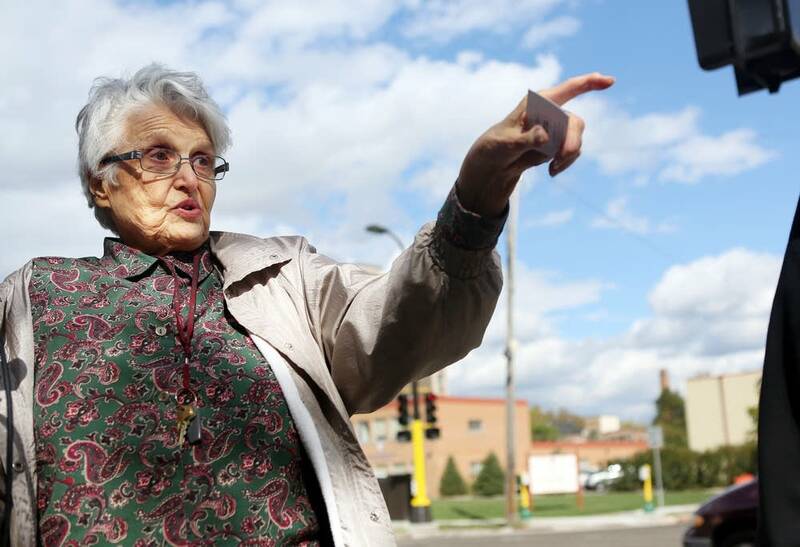 When Laugen crossed Park Avenue South just steps away from her apartment building, the intersection had no stoplight. Elizabeth Smith, one of Laugen's neighbors, helped organize the effort to persuade city officials to install the new traffic signal at the intersection. She prepared data for the city showing that 85 of the high rise apartment building's residents use scooters, walkers or wheelchairs, 17 have low vision and 38 are hearing impaired, although Laugen wasn't among them. "I could see it happening to somebody that was totally disabled because, you know, they didn't have a chance, but Louise was perfectly healthy and that," Smith said. "They just didn't see her." At Park Avenue South and East 27th Street, Laugen's friends have tied a bouquet of flowers to a sign post. They hope to install a more permanent memorial soon to remind everyone why it's finally easier to cross the street. The Minnesota Department of Transportation says it's difficult to single out the most dangerous intersections because of limited data. But the intersections listed below have been identified as problem areas because of frequent crashes or a high number of crashes that resulted in serious injury or death. The crash statistics listed are from 2007-2011. • U.S. Highway 61 (Arcade Street) through St. Paul: 10 fatal or serious injury crashes.